The U.S. Gets More Tornadoes Than Anywhere Else In The World. But Why? 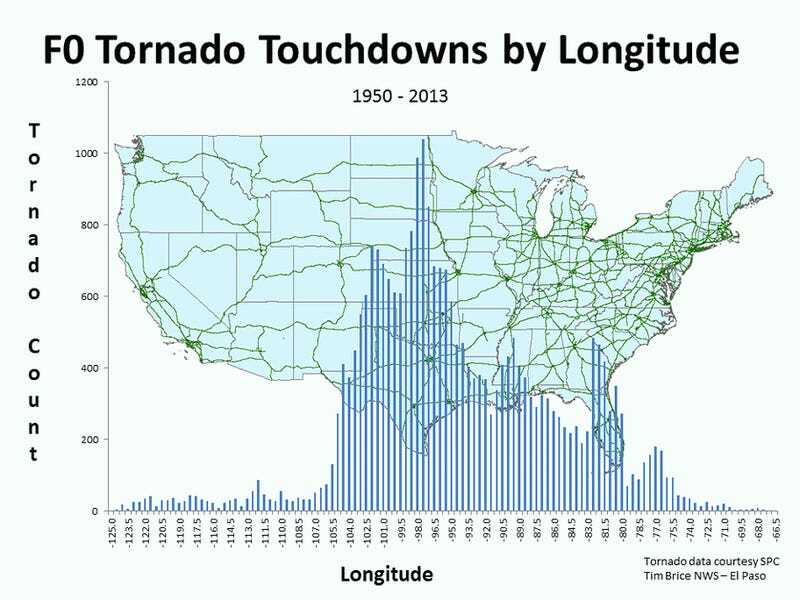 Tim Brice, a meteorologist with the NWS based out of El Paso, put together the series of graphs, which plot out every tornado occurring between 1950-2013 by its latitude and longitude. You can see the charts for all tornadoes by latitude and longitude below. Especially interesting, though, are the GIFs above where Brice further breaks down the data to see which longitudes and latitudes were most often hit by very strong or by comparatively weaker tornadoes, ranging from F0 to F5. It's striking to see how heavily hit the areas with the highest concentrations of tornadoes are, especially among the strongest categories. 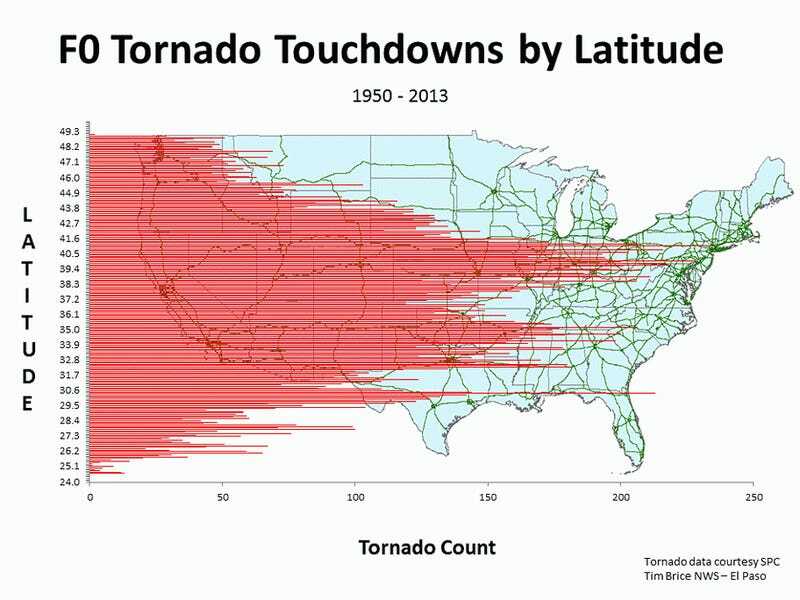 Also striking, though, is how distributed the tornadoes are even beyond their most common ranges, with a recorded tornado seen at almost every longitude or latitude. I'm glad everyone has enjoyed the maps. What I found interesting about the maps were some of the distribution patterns. A lot of people have speculated about the lower tornado touchdown numbers centered around 37º Lat. Seems to me that this occurs about where the Appalachian mountains make their furthest westward extent. The mountains don't eliminate tornadoes, but they do lessen their frequency. On the Longitude map I found it interesting that you could clearly see how far west the moisture push was (or in this case wasn't) with a very sharp drop off at around 105º Lon. Also I noted a nice little spike around 81º corresponding to the tornadoes in Florida .